In yesterday’s post, we talked about wearing stripes and I really must say when it comes to knitting stripes, I’m very impressed with the VERY NEW Red Heart’s striped pattern repertoire. On With Love Stripes page, there are already several striped patterns linked directly to the yarn, but when you’re first working with self-striping yarns, it can be confusing and you’re really not sure where to start. Score one for Red Heart because they’ve already got so many patterns ready to go for you. The first one I’m going to go over with you is the Self-Striping Baby Blanket. This little baby looks like she’s enjoying her blanket. It’s made from the colorway Candy Stripe. When I first unboxed this yarn, I was thinking to myself that the color repeats couldn’t be that long, that they’d be best for socks. Really thick socks at that, but what else was I going to make with them. 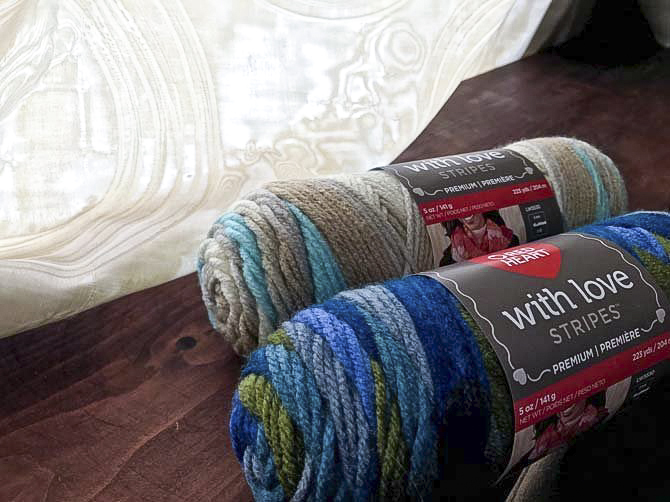 With Love Stripes, the very NEW yarn from Red Heart – so much to explore with this self-striping yarn! I’m no longer skeptical about these striped skeins because when I actually did measure the length of the yarn in the repeat it was 27”, as I said in Tuesday’s post. Again, as I said in Tuesday’s post, you really don’t realize what kind of length that gives you until you’re knitting with it. This blanket calls for 118 stitches to be cast on and the final measurements are 36” x 38”. 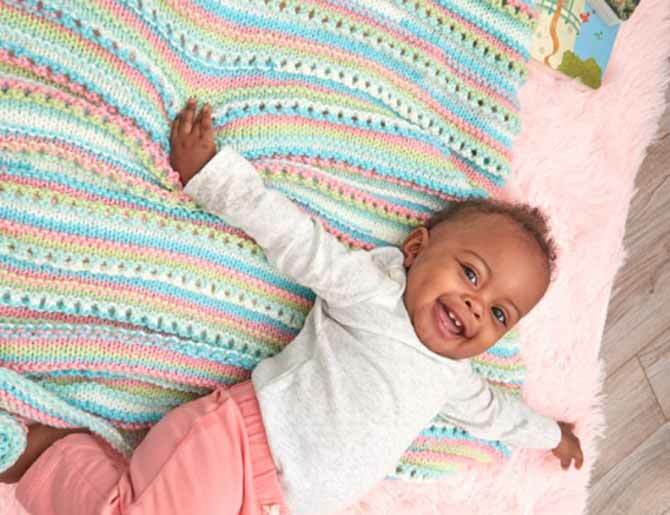 That’s a crib blanket, there’s no way around it. I can’t believe the stripe pattern is still happening at that length, but it makes complete sense to have the pattern repeats that long. 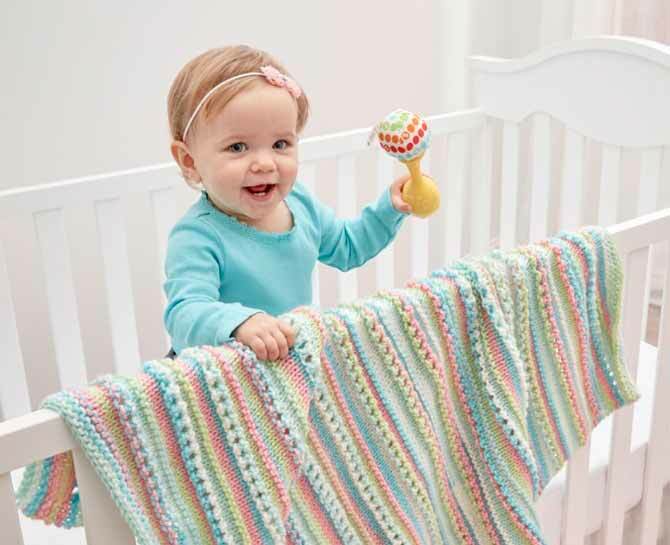 There are going to be many happy baby blanket knitters out there. Here is a closeup of the pattern and boarder. It’s not difficult to memorize. The pattern itself is a simple one, easy to memorize. There are really only two rows of pattern and the other ten are variations on stockinette and garter stitch. It adds texture around the pattern rows and a garter stitch boarder. With this pattern you’ll be zipping away in no time. If you’re not one for patterns, you can simply use the shell of this pattern for your own baby blanket. Cast on 118 stitches and do five rows of a garter stitch boarder (to prevent curling) and head off into stockinette oblivion. You’ll get the same nice slim stripes as you see in the pattern, but with a stockinette finish. Don’t forget to do your garter stitch boarder as you go and at the very end of your blanket. As mentioned in Wednesday’s post, you’ll notice how this baby is accessorizing her stripes and wardrobe. She takes a color from the blanket and uses that to accentuate the look the stripes already initiate. This is an excellent pattern to start sharpening your appetite for stripes. If you don’t currently have any babies to knit for, or any on the way, you can always knit this up and put it in the future gift pile. There’s no harm being prepared and you never know when you’ll need an unexpected baby shower gift. This is part 3 of 4 in this series. The picture shown here looks like pattern has more than just garter borders and stockinette. I see eyelets that implies yarn overs possibly? Is there a pattern available for the blanket as shown? I love the colours of the blanket! The boarder is a nice touch as well. Some day I will be able to make this! This is a beautiful blanket! I am entering this hoping to win so I can learn to knit things like this! What a lovely baby blanket! I admire the skill that makes the colours work so well. So bright and beautiful! Thanks for sharing :) Im gonna make one for my sister! What a beautiful blanket! I love the colour work.. so lovely! I want to make a baby blanket for my first born. I don’t think I have the skills yet, but hopefully soon. That is such a beautiful baby blanket. It would definitely make a precious gift. This is such an adorable blanket! 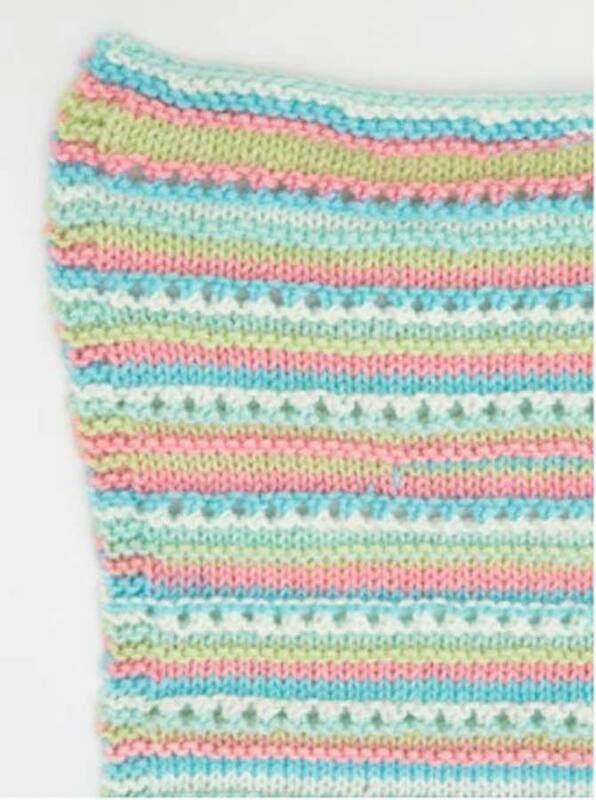 The stripes are lovely and I feel like the texture would be really fun for little baby hands to grab and play with. Just found this blog and know I will find patterns and projects to explore. This one caught my eye as I have plans to make a baby blanket for a friend. Thanks for showing me this new self striping yarn. Oh enjoy!!!! The baby blanket is a quick knit, but with enough interest so you don’t get bored!